In less than two weeks, Miss USA will be crowned and one of the hopeful contestants is from Southeast Alaska. 27-year-old Alyssa London touched down in Las Vegas earlier this week to prepare for the beauty pageant. She was crowned Miss Alaska USA earlier this year and is the first Tlingit woman to hold that title. London has become somewhat of a spokesperson for her culture. London is the first Tlingit woman to be crowned Miss Alaska USA and on May 14, in front of a television audience of millions, London will showcase those roots. 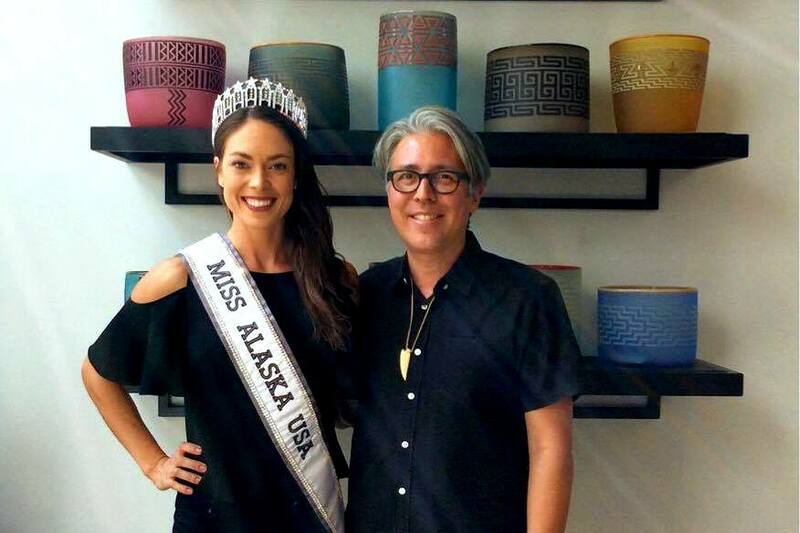 Her evening gown for the Miss USA pageant is adorned with Tlingit designs. The gown’s designer is Joey Galon and the Tlingit artist Preston Singletary is responsible for the killer whale art that adorns it. London hand selected those two and said she’s been working for months for that moment. That work– it’s not over quite yet. “So over the next couple of days I’ll go through rehearsals and training practices in order to make sure that I can effectively perform the gown in 20 seconds,” London said. Showing off months of work in just a few short seconds is stressful, though. London said time management has been the most difficult part of her preparations. “I’ve been on a time crunch this whole time and it’s been hard to rush everything,” London said. London was crowned Miss Alaska USA in February this year, and she’s been working and traveling ever since. She’s been on the road a lot, but London has found a way to stay healthy. She’s proud of her body, posting photos and videos of herself on social media running on the treadmill or doing squats at the gym. If she wins, London would make history. She’d be the first winner from Alaska and the first with Native American or Alaska Native heritage. At stake is more than a crown, though. She’s got a message, too. “I’m focusing on empowering women to design the life of their dreams through entrepreneurship, through getting their education because when you pursue your education it opens doors for all of the goals you have for yourself,” London said. Alyssa London will take that message to the national stage at the Miss USA pageant Sunday, May 14.